"Datafeed Studio has enabled us to roll out our project in half the time we imagined it would take. Combine this with friendly and responsive support and you're on to something good"
A bug fix release recommended for all users. If you are upgrading remember to backup your templates folder before extracting the new version if you want to retain any custom template changes you may have made. anywhere within the page/post content. Sometimes you may want to access product information contained within your affiliate datafeeds outside of a Datafeed Studio created site, e.g. inside a WordPress blog. This post will show you how to easily achieve this if your WordPress site (or similar) resides on the same physical server as your Datafeed Studio installation. To illustrate what is possible I’ve quickly created a new WordPress site for the Pleo Toy. This WordPress theme has three columns. The middle column is the one we are interested in – it shows all the current prices and retailers of the Pleo according to the data held in our Datafeed Studio installation. Just paste these into the appropriate file of your WordPress theme and you can get a similar list of product prices, such as these Pleo Prices embedded in your blog or web site. A future article will show a similar method integrating with WordPress custom fields to dynamically do a product price compare within WordPress. Quick Update – the latest version (V1.6.2) of Datafeed Studio now comes with built-in datafeed parsers for the Paid On Results and ShareASale affiliate networks. If you have any feedback on these parsers, or have a suggestion for a new one, please don’t hesitate to contact me. Don’t forget you are not limited to this list, you can easily create your own within the application by specifying the mapping of internal database fields to that of the CSV file you want to parse. Datafeed Studio now supports SEO friendly URLs for your product categories and products. Hmm…I suppose that is a slight improvement I hear you say, but wouldn’t it be great if I could choose the value of the URL myself. 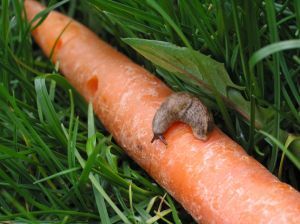 The latest Datafeed Studio release has “slug” support. Every product in your database can now have an unique slug (or path or permalink, call it what you will), so you can finally have URLs of your choosing, e.g. To demonstrate the new URL structure I’ve created a new baby car seat site, check it out to see the new SEO friendly URLs in action. If you still prefer the non-SEO friendly URLs just set the SEO_FRIENDLY_URLS option to zero (this option can also be set in the site specific configuration files so you can enable/disable it on a per site basis). The current release of Datafeed Studio now supports “local site styles”. Previously a site would get all of its look and feel based on the theme it was associated with, e.g. 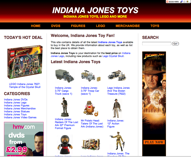 Indiana Jones Toys is associated with the store theme known as “modern”. However, if you then wanted to make a new store site with a different look you would have to make a complete copy of the theme, e.g. “modern2″ and use that for the new site. This method still works, but is a bit tedious if all you want to do is change the font colour and a few other minor presentation changes on your new site. So the latest release of Datafeed Studio supports local styles. When you register a new site a copy of the main CSS file (style.css) of the theme you have chosen for the new site is automatically created and placed in the site_configs folder. Now instead of using the style.css file in the theme, your site will use the new copy in the site_configs folder, this allows you to do local customisations without changing the main theme. 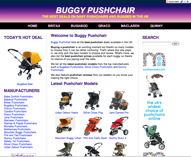 As an example I have created a new Baby Pushchair site, like the Indiana Jones site mentioned above, this uses the “modern” theme and I didn’t have to create a “modern2″ theme to accommodate the presentation changes I wanted to make, they are all controlled by the local CSS file, which can be edited via the new Style link which is now present for store and price compare sites on the admin home screen. So in summary, if you want to make a new affiliate site with a radically different look, then by all means create a new theme as usual, but if your new site is just a few cosmetic changes to an existing theme, simply make your changes via the Style link. I hope you all like this new feature – I’m sure it will help you create affiliate sites quicker and easier than the previous solution. Datafeed Studio now supports the addition of custom products for situations when you wish to add products to a database that for one reason or another don’t exist in a merchants datafeed. One great alternate use for custom products is for creating affiliate sites with completely unique content. This approach gives you the best of both worlds – unique content coupled with dynamic price comparison of products that match the criteria you supply. Certain Datafeed Studio niche online store themes take advantage of the “Price Compare this Product?” input field that is available when you edit a product. Normally, when you build a niche online store using Datafeed Studio it is in traditional “one product, one merchant” mode, i.e. the application displays the product information directly as it comes the datafeed, with a single price, that of the merchant the product belongs to. However, price comparison is a very effective method to increase your sales, and adds real value to your site, steering it away from that of a mere thin affiliate. The Datafeed Studio product editor allows you take advantage of this and as an advanced option allows you to provide the SQL to use to generate a dynamic price comparison of the product being viewed. For example, let’s take a look at the rather nifty Cargo Truck product on the example Indiana Jones Toys website. the page instead displays all products from merchants that match the criteria specified. Intimidated by the hairy SQL? No need to be – this SQL can be automatically generated from Datafeed Studio’s search facility. 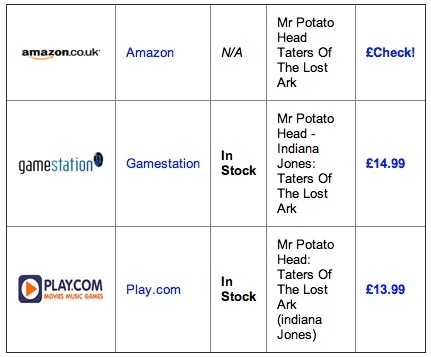 If you did a search for “indiana jones cargo truck” the software shows you the SQL query generated to do the search – all you have to do is copy’n'paste it into your product and ta-da – instant price comparison and improved conversion rates for you! Welcome to the blog for Datafeed Studio – a great new tool for creating multiple affiliate web sites. This blog will document Datafeed Studio tips’n'tricks, highlight new themes and sites created with the application, and keep you up to date with all new releases. If you own Datafeed Studio (thanks!) then it is strongly recommended that you subscribe to this blog, either via the RSS feed or e-mail (see the sidebar for more information). If you have any comments or queries regarding Datafeed Studio, or any feature requests, get in touch at support@datafeedstudio.com.